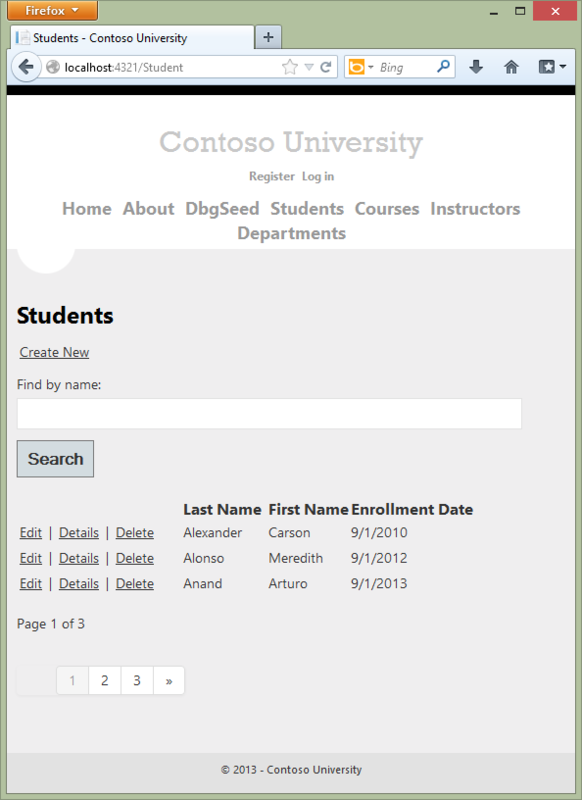 The Contoso University sample web application demonstrates how to create ASP.NET MVC 4 applications using the Entity Framework 5 Code First and Visual Studio 2012. For information about the tutorial series, see the first tutorial in the series. You can start the tutorial series from the beginning or download a starter project for this chapter and start here. If you run into a problem you can't resolve, download the completed chapter and try to reproduce your problem. You can generally find the solution to the problem by comparing your code to the completed code. For some common errors and how to solve them, see Errors and Workarounds. 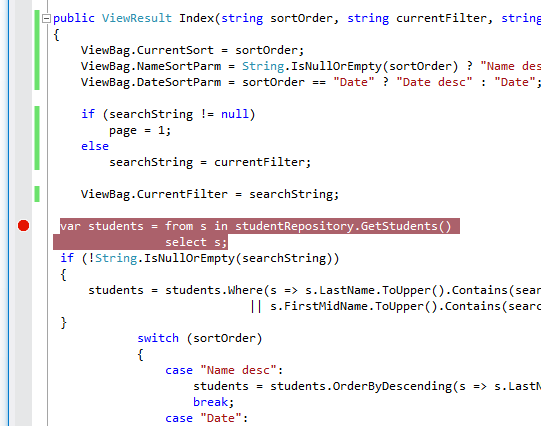 In the previous tutorial you used inheritance to reduce redundant code in the Student and Instructor entity classes. In this tutorial you'll see some ways to use the repository and unit of work patterns for CRUD operations. As in the previous tutorial, in this one you'll change the way your code works with pages you already created rather than creating new pages. The repository and unit of work patterns are intended to create an abstraction layer between the data access layer and the business logic layer of an application. Implementing these patterns can help insulate your application from changes in the data store and can facilitate automated unit testing or test-driven development (TDD). In this tutorial you'll implement a repository class for each entity type. 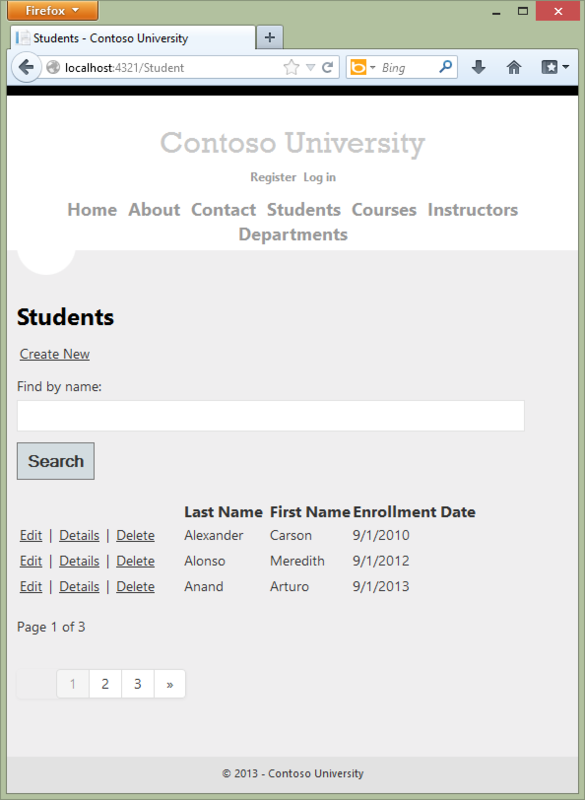 For the Student entity type you'll create a repository interface and a repository class. When you instantiate the repository in your controller, you'll use the interface so that the controller will accept a reference to any object that implements the repository interface. When the controller runs under a web server, it receives a repository that works with the Entity Framework. When the controller runs under a unit test class, it receives a repository that works with data stored in a way that you can easily manipulate for testing, such as an in-memory collection. Later in the tutorial you'll use multiple repositories and a unit of work class for the Course and Department entity types in the Course controller. The unit of work class coordinates the work of multiple repositories by creating a single database context class shared by all of them. If you wanted to be able to perform automated unit testing, you'd create and use interfaces for these classes in the same way you did for the Student repository. However, to keep the tutorial simple, you'll create and use these classes without interfaces. The following illustration shows one way to conceptualize the relationships between the controller and context classes compared to not using the repository or unit of work pattern at all. 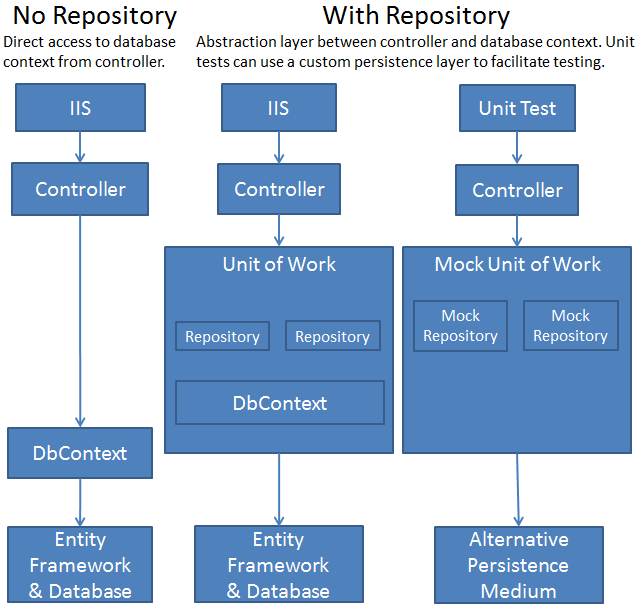 Using Repository and Unit of Work patterns with Entity Framework 4.0 on the Entity Framework team blog. Agile Entity Framework 4 Repository series of posts on Julie Lerman's blog. Building the Account at a Glance HTML5/jQuery Application on Dan Wahlin's blog. There are many ways to implement the repository and unit of work patterns. You can use repository classes with or without a unit of work class. You can implement a single repository for all entity types, or one for each type. If you implement one for each type, you can use separate classes, a generic base class and derived classes, or an abstract base class and derived classes. You can include business logic in your repository or restrict it to data access logic. You can also build an abstraction layer into your database context class by using IDbSet interfaces there instead of DbSet types for your entity sets. The approach to implementing an abstraction layer shown in this tutorial is one option for you to consider, not a recommendation for all scenarios and environments. This code declares a typical set of CRUD methods, including two read methods — one that returns all Student entities, and one that finds a single Student entity by ID. You could instantiate a new context in the repository, but then if you used multiple repositories in one controller, each would end up with a separate context. Later you'll use multiple repositories in the Course controller, and you'll see how a unit of work class can ensure that all repositories use the same context. The repository implements IDisposable and disposes the database context as you saw earlier in the controller, and its CRUD methods make calls to the database context in the same way that you saw earlier. 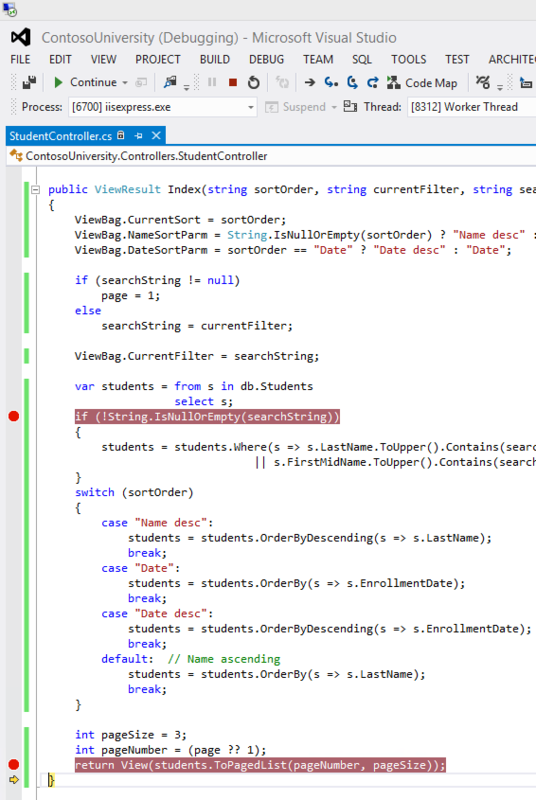 In StudentController.cs, replace the code currently in the class with the following code. The changes are highlighted. The default (parameterless) constructor creates a new context instance, and an optional constructor allows the caller to pass in a context instance. Run the site and click the Students tab. Only the highlighted code has changed. In the original version of the code, students is typed as an IQueryable object. The query isn't sent to the database until it's converted into a collection using a method such as ToList, which doesn't occur until the Index view accesses the student model. The Where method in the original code above becomes a WHERE clause in the SQL query that is sent to the database. That in turn means that only the selected entities are returned by the database. However, as a result of changing context.Students to studentRepository.GetStudents(), the students variable after this statement is an IEnumerable collection that includes all students in the database. The end result of applying the Where method is the same, but now the work is done in memory on the web server and not by the database. For queries that return large volumes of data, this can be inefficient. This query returns all of the student data because the repository executed the query without knowing about the search criteria. The process of sorting, applying search criteria, and selecting a subset of the data for paging (showing only 3 rows in this case) is done in memory later when the ToPagedList method is called on the IEnumerable collection. In the previous version of the code (before you implemented the repository), the query is not sent to the database until after you apply the search criteria, when ToPagedList is called on the IQueryable object. When ToPagedList is called on an IQueryable object, the query sent to SQL Server specifies the search string, and as a result only rows that meet the search criteria are returned, and no filtering needs to be done in memory. The following section shows how to implement repository methods that enable you to specify that this work should be done by the database. You've now created an abstraction layer between the controller and the Entity Framework database context. If you were going to perform automated unit testing with this application, you could create an alternative repository class in a unit test project that implements IStudentRepository. Instead of calling the context to read and write data, this mock repository class could manipulate in-memory collections in order to test controller functions. In this section of the tutorial, you'll create a GenericRepository class and a UnitOfWork class, and use them in the Course controller to access both the Department and the Course entity sets. As explained earlier, to keep this part of the tutorial simple, you aren't creating interfaces for these classes. But if you were going to use them to facilitate TDD, you'd typically implement them with interfaces the same way you did the Student repository. The code Expression<Func<TEntity, bool>> filter means the caller will provide a lambda expression based on the TEntity type, and this expression will return a Boolean value. For example, if the repository is instantiated for the Student entity type, the code in the calling method might specify student => student.LastName == "Smith" for the filter parameter. The code Func<IQueryable<TEntity>, IOrderedQueryable<TEntity>> orderBy also means the caller will provide a lambda expression. But in this case, the input to the expression is an IQueryable object for the TEntity type. The expression will return an ordered version of that IQueryable object. For example, if the repository is instantiated for the Student entity type, the code in the calling method might specify q => q.OrderBy(s => s.LastName) for the orderBy parameter. When you call the Get method, you could do filtering and sorting on the IEnumerable collection returned by the method instead of providing parameters for these functions. But the sorting and filtering work would then be done in memory on the web server. By using these parameters, you ensure that the work is done by the database rather than the web server. An alternative is to create derived classes for specific entity types and add specialized Get methods, such as GetStudentsInNameOrder or GetStudentsByName. However, in a complex application, this can result in a large number of such derived classes and specialized methods, which could be more work to maintain. One of these lets you pass in just the ID of the entity to be deleted, and one takes an entity instance. As you saw in the Handling Concurrency tutorial, for concurrency handling you need a Delete method that takes an entity instance that includes the original value of a tracking property. This generic repository will handle typical CRUD requirements. When a particular entity type has special requirements, such as more complex filtering or ordering, you can create a derived class that has additional methods for that type. The unit of work class serves one purpose: to make sure that when you use multiple repositories, they share a single database context. That way, when a unit of work is complete you can call the SaveChanges method on that instance of the context and be assured that all related changes will be coordinated. All that the class needs is a Save method and a property for each repository. Each repository property returns a repository instance that has been instantiated using the same database context instance as the other repository instances. Each repository property checks whether the repository already exists. If not, it instantiates the repository, passing in the context instance. As a result, all repositories share the same context instance. The Save method calls SaveChanges on the database context. Like any class that instantiates a database context in a class variable, the UnitOfWork class implements IDisposable and disposes the context. In the rest of the class, all references to the database context are replaced by references to the appropriate repository, using UnitOfWork properties to access the repository. The Dispose method disposes the UnitOfWork instance. Run the site and click the Courses tab. The page looks and works the same as it did before your changes, and the other Course pages also work the same. You have now implemented both the repository and unit of work patterns. You have used lambda expressions as method parameters in the generic repository. For more information about how to use these expressions with an IQueryable object, see IQueryable(T) Interface (System.Linq) in the MSDN Library. In the next tutorial you'll learn how to handle some advanced scenarios. Links to other Entity Framework resources can be found in the ASP.NET Data Access Content Map.